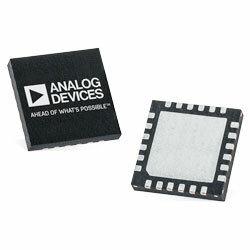 Analog Devices LTC4041 2.5A Supercapacitor Backup Power Manager is a backup system for 2.9V to 5.5V supply rails. The device has a high current step-down DC-DC converter to charge a single supercapacitor or two supercapacitors in series. When input power is not available, the step-down regulator operates in reverse as a step-up regulator to backup the system output from the supercapacitor(s). The device’s adjustable input current limit function decreases charge current to protect the input supply from overload whilst an external disconnect switch isolates the input supply throughout backup. When the input supply drops below the adjustable PFI threshold, the 2.5A boost regulator transfers power from the supercapacitor to the system output. An optional input OVP circuit protects the device from high voltage damage at the VIN pin. An internal supercapacitor balancing circuit sustains equal voltages across each supercapacitor and limits the maximum voltage of each supercapacitor to a pre-determined value. The device is offered in a low profile (0.75mm) 24-lead 4mm x 5mm QFN package.